The world stopped this weekend because Beyoncé released her newest visual album, Lemonade with an HBO event this weekend. It seems to be a story album about her husband Jay-Z‘s rumored infidelity and their make-up. It certainly seems as though all is forgiven since the album is only available on Tidal. Obviously, the Beyhive went nuts. 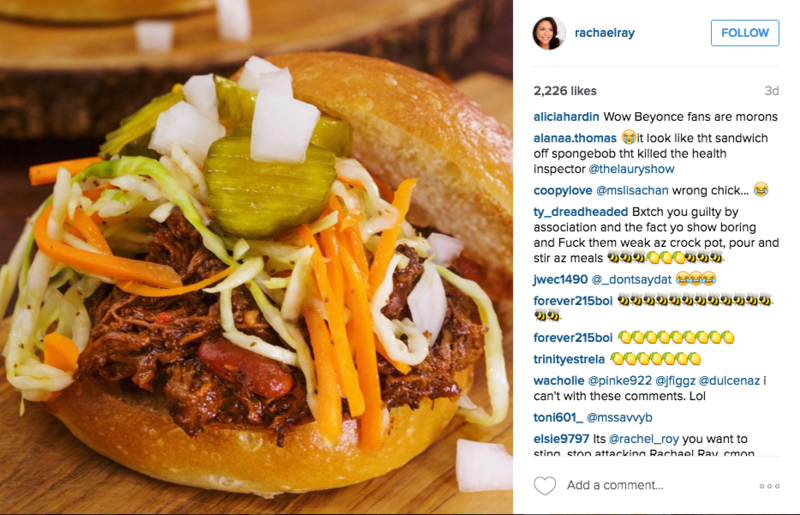 Unfortunately, Rachael Ray has a name that sounds almost like Roy’s, and the Beyhive, quick to react, swarmed the celebrity chef who was just trying to post a picture of a pulled pork sandwich. The picture, as of this posting, has 2,447 comments. By comparison, the one before it has 149.